– Folklore was mentioned in the Tampa Bay Times in June of 2016. Read the web edition here. – Folklore was featured in the Tampa Tribune in March of 2016. Read the web edition here. – Folklore was on WMNF’s “Art in Your Ear” in February of 2016 with Founder, Gina Moccio; March speaker, Sarah Howard; and June speaker, Ray Roa. Listen here. Left to Right: Tracy Midulla Reler (Founder of Tempus Projects); Sarah Howard, Curator of Public Art and Practice at USF Institute for Research in Art and speaker at Folklore on March 2; JoEllen Schilke, The hostess that loves you the mostess and Host of WMNF’s Art in Your Ear; Ray Roa, Founder of SubAp! and speaker at Folklore on June 1; Gina Moccio, Founder of Vessel Collective, the umbrella project for Folklore; Langdon Graves, Brooklyn-based artist whose solo exhibition opens at Tempus Projects on Saturday, Feb. 27. 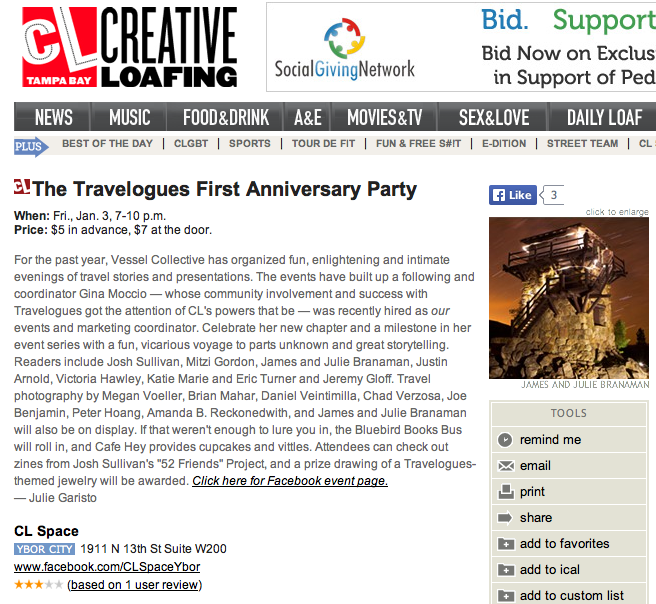 – ‘The Travelogues’ received birthday love from Creative Loafing in January of 2014. Read the mini-feature here. 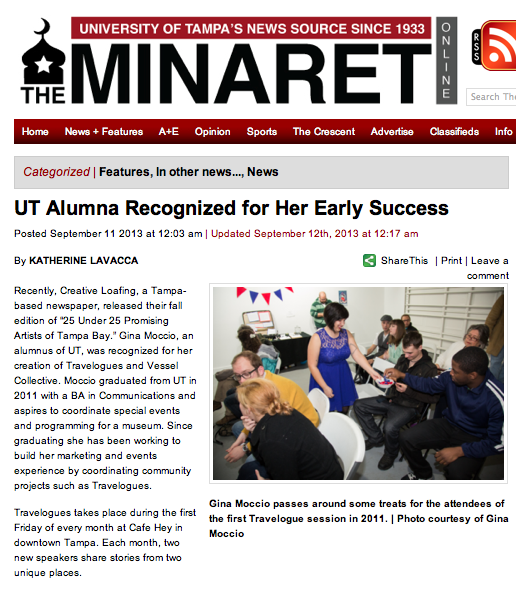 – ‘The Travelogues’ founder, Gina Moccio, was featured by the University of Tampa’s The Minaret in September of 2013. View the feature here. 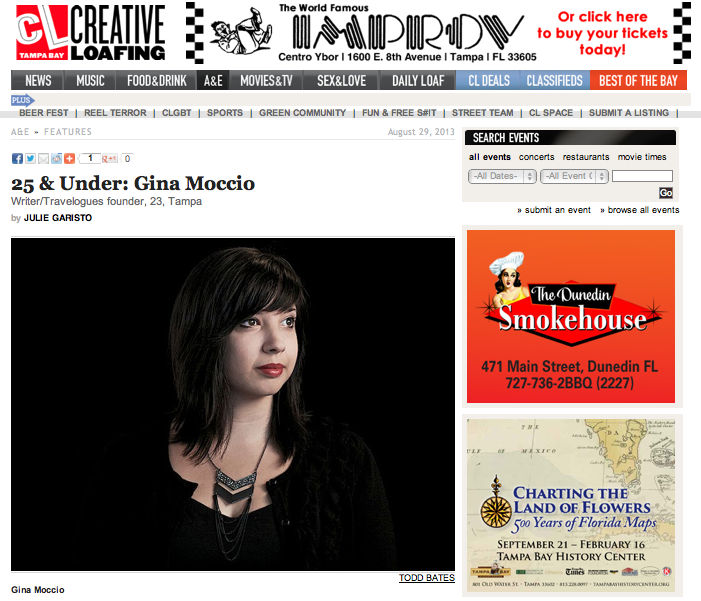 – ‘Travelogues’ host and producer, Gina Moccio, was featured in Creative Loafing’s ’25 Promising Artists Under 25′ in 2013. View the feature here. 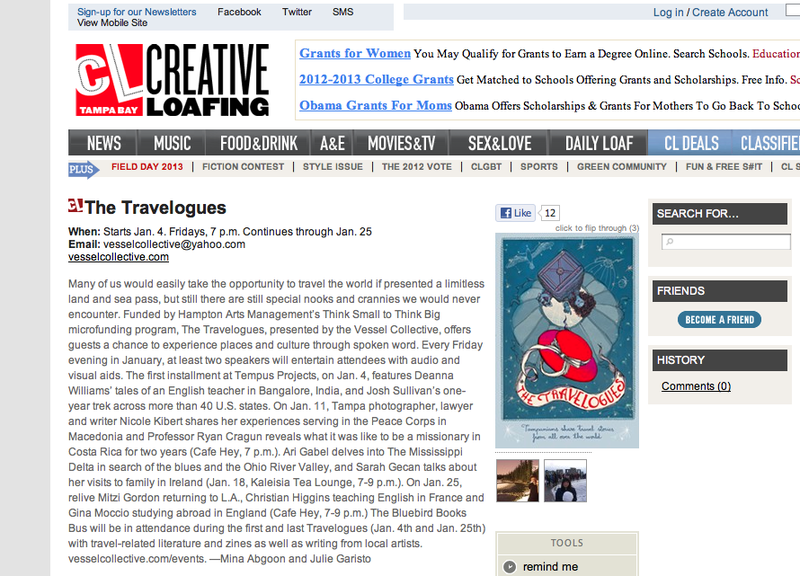 – ‘The Travelogues’ were featured online at Creative Loafing by Stephanie Powers. 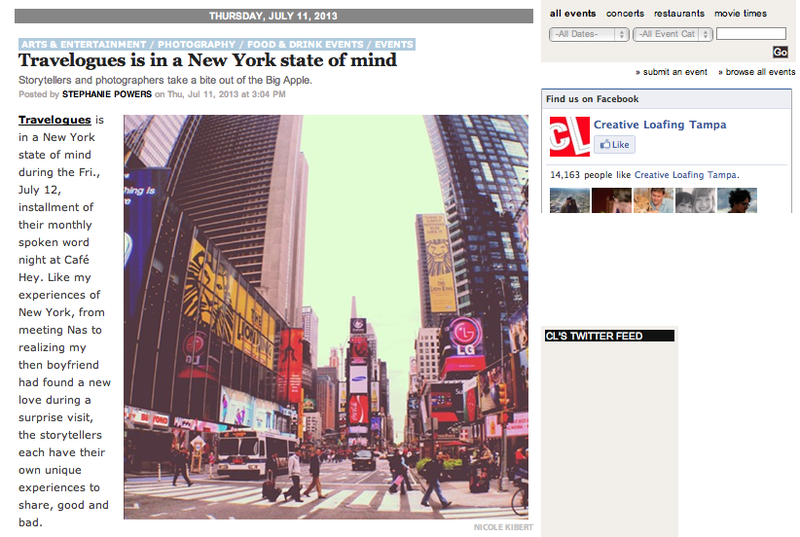 We’re in a ‘New York State of Mind’ for our NY themed Travelogue in July of 2013. View the event preview here. – ‘The Travelogues’ were featured online at 83 Degrees Media in June of 2013. Read about what to expect from June’s speakers here. 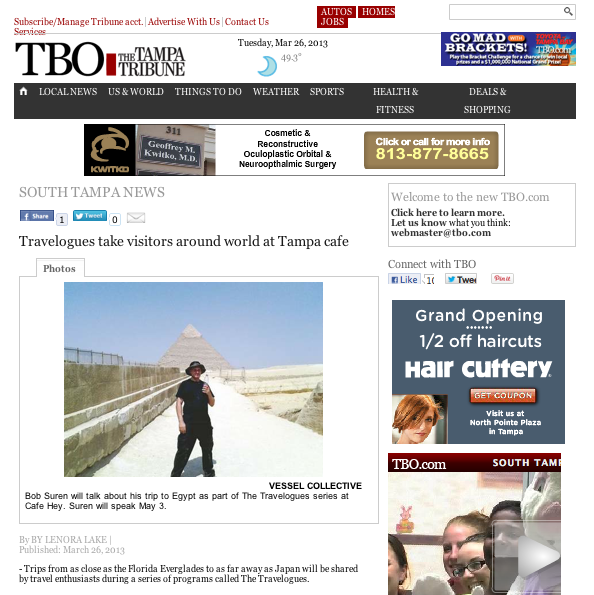 – ‘The Travelogues’ were featured online in March of 2013 by the Tampa Tribune. Read about what to expect from the event and the speaker lineup here. 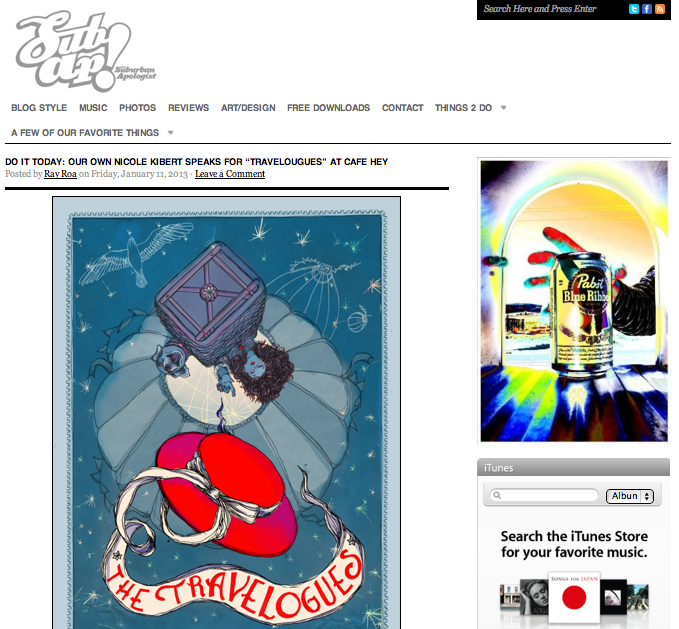 – ‘The Travelogues’ were featured in Creative Loafing’s print version under their ‘Do This’ section and online in January of 2013. You can view the online version here. – ‘The Travelogues’ were featured on WMNF’s ‘Art in Your Ear’ with JoEllen Schalke in January of 2013. – ‘The Travelogues’ were featured on WMNF’s Drive-Time News Thursday on January 3rd 2013. -‘The Travelogues’ were featured on Suburban Apologist in January of 2013. Week two of The Travelogues on Sub Ap’s ‘Do it Today’ can be seen here. 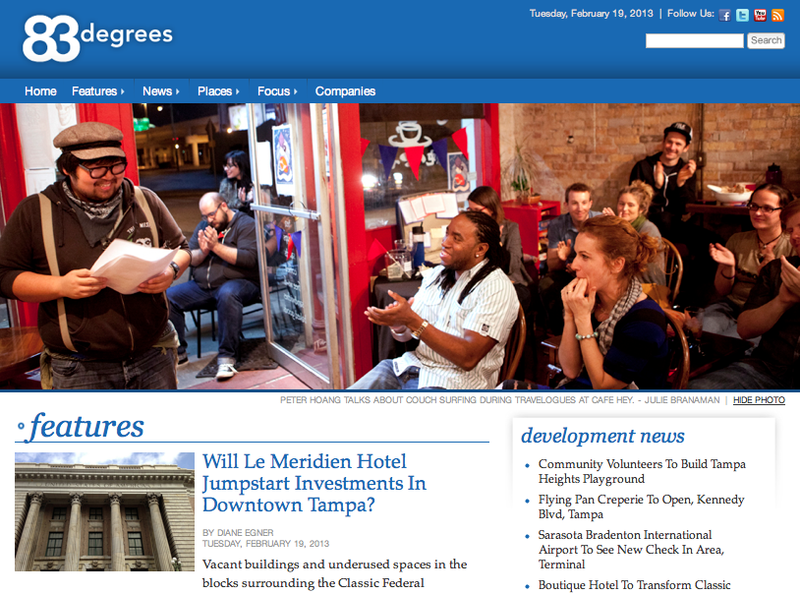 -Check us out on 83 Degrees Media’s masthead, featuring Travelogues speaker, Peter Hoang. Original photo by Julie Branaman. 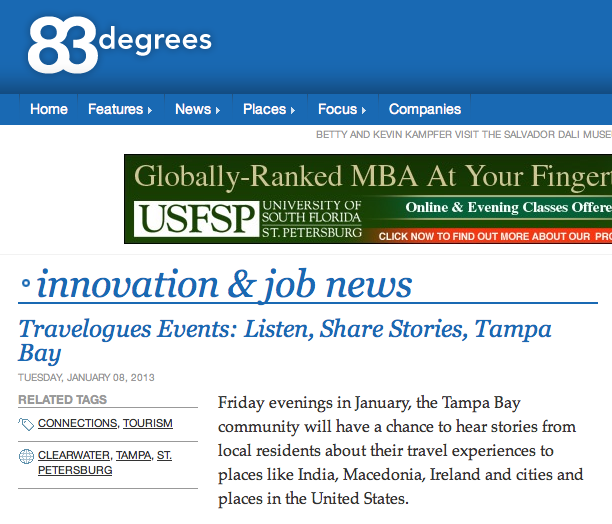 – ‘The Travelogues’ were featured on 83 Degrees Media in January of 2013 under the ‘Innovation and Jobs News’ section. The full article can be viewed here.